While on vacation last week I found this picture on pinterest. I couldn’t find where the image originated from, but I thought it was a great way to show mindfulness. 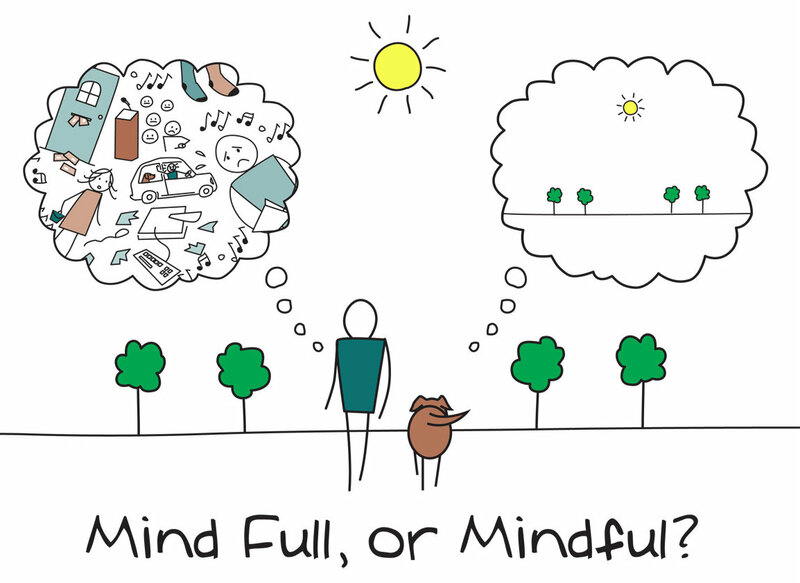 I know I can relate to the person in the drawing, but I would love to experience more of the pup’s clear mind. I am sure we all would. Last post I explained what mindfulness is and today I am going to share some of the research. When I did a simple google search for: “Mindfulness in Schools Research” I received over 1 MILLION results! Why? Because this is a topic that matters and recently, research has been expanding rapidly. One of the statements that stood out to me the most was when he talked about how “mindfulness can change the world, literally, one person, one relationship, at a time” because it can have a positive impact by reducing bullying or violence. My professors told us in class this past spring that by practicing mindfulness even a few minutes a day can have a HUGE impact. I am not sure what source this information is from, but I do recall reading it through my intervention course. Hearing that fact, as well as reading it, helped me realize that mindfulness is something that I can actually practice and fit into my day. Look for my 3rd post soon, which will focus on mindfulness curriculum and resources. Categories: Counseling, Education, Online Resources, School Climate, School Counseling, Self-Care, Social Emotional Learning | Tags: Counseling, Counseling Techniques, Education, health benefits, Mental health, mental health counseling, mindfulness, positive impact, research, School Counseling, SEL, Self-Care, Social Emotional Learning | Permalink. Hey there! I started blogging about my experiences through graduate school and now have continued as a working school counselor. I am currently working in an elementary school but try hard to keep up-to-date on all things school counselor, as well as topics in education. I hope to share ideas, document what I am doing, network, be inspired, inspire, and collaborate with others through this blog. My professional portfolio can be found here: http://elizabethcranford.weebly.com/ Thanks for stopping by! I love the Whole-Brain Child by Dr. Siegel–in fact, I’ve lent it out so many times I’m not even sure which colleague has it now. Thats currently on my books to read list. I have heard good things about it. Thanks for the suggestion Catherine.